​Dettica provides high performance M&A integration, divestiture and carve-out separation services globally. These services are positioned across business and technology and combine functional expertise with first class governance and business change management capabilities. ​​Our clients include leading global public companies that have subsequently demonstrated sustained, above-average shareholder value creation from M&A. Our passion is to enable many more companies to achieve this same level of success. Which means we are fully committed to playing our part in creating the leading companies of tomorrow, in addition to supporting those we all know today. ​We have provided leadership and governance services for many complex, global transactions, with typical transaction values ranging between $700 million to $3 billion US. All our consultants are vastly experienced in M&A and are able to leverage extensive top-tier technology skills. With a vast exposure to different business sectors and organisations, from small to very large, entrepreneurial to highly structured and procedural, we know what works and what doesn't. 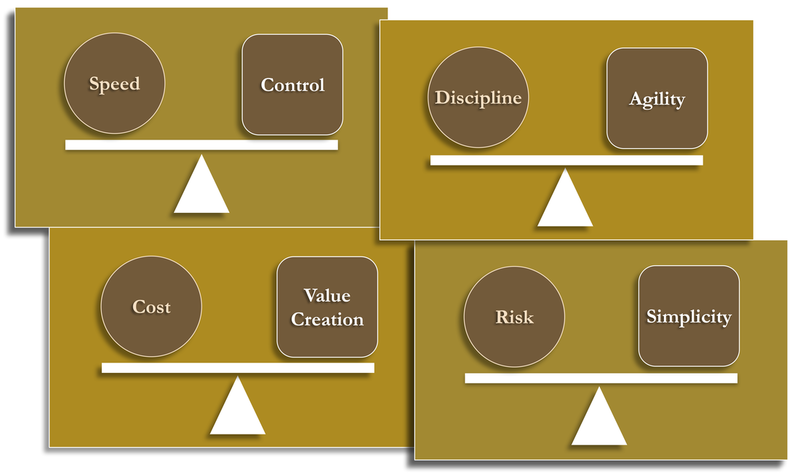 The key is selecting the right balance of speed, agility, value creation and simplicity, whilst not losing control, overshooting on costs or putting the business at risk. With decades of experience successfully delivering our clients major transactions and transformations, we know how challenging this balance is to achieve and thats why we have tuned our services to get this right. By engaging us, we will help you join the small percentage of companies globally, that have the capability to routinely execute high performance M&A integrations and divestiture separations. In the meantime, here's a breakdown of the most significant risks affecting M&A integration performance. Our consultants have been engaged to shape, lead and provide governance for many complex global acquisition integrations and divestiture / carve-out separations. Transactions values have typically been in the range $0.7-3 billion US and with an operational impact involving up to ninety two countries. 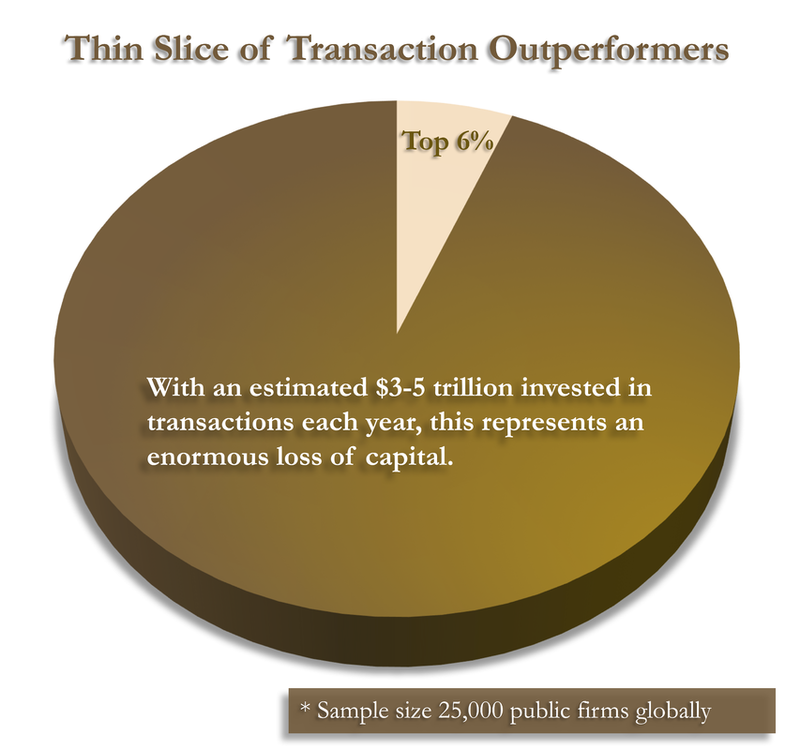 Our clients have subsequently been independently assessed as belonging to the top 6% of global public M&A performers. We can deploy a single expert or rapidly mobilise a small team that will address specific transaction capability gaps. We can leverage extensive technology, business change and governance expertise, alongside decades of M&A. Our lean and hands-on approach is fully supported by our consultants ability to 'wear many hats', 'get in the boat and row' and land with a 'strike-force mentality'. This, combined with our high performance work ethic, innovative approach and essential business mentoring, enables us to achieve benchmark levels of 'more with less'. 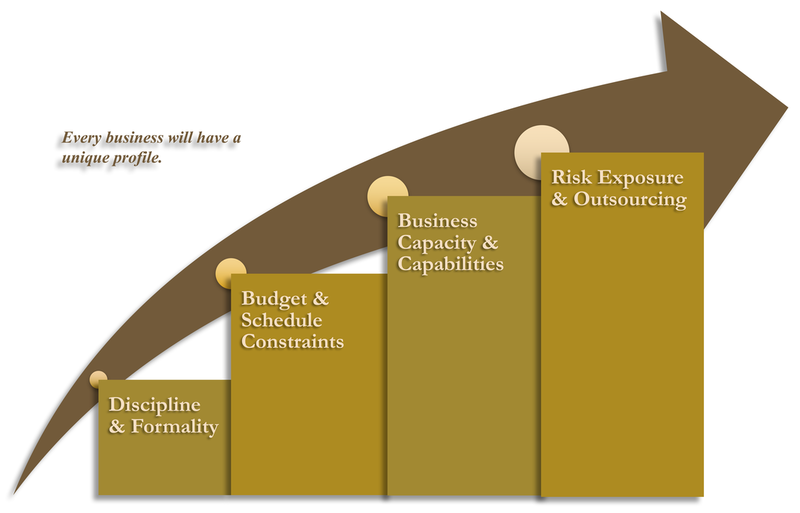 •	Supporting stakeholder management and communications planning. •	Implement an inflexible approach constrained by delivery partner inertia and padded with 'nice to haves'. Our approach always puts you at the centre. Dettica was founded in the UK in 2007 and has since provided its services truly globally. Its mission is to make inorganic growth a realisable option and one that imparts true competitive edge. At present only around 6% of corporate portfolio managers achieve this and that's a statistic we will continue to improve. Please visit our publications section if you would like to learn more about Dettica and how we serve our clients. If you would like more information on how we are able to help your inorganic growth initiatives, in the first instance please use the contact form below or e-mail our managing partner Leyton Price ( lprice@dettica.co.uk ). If you would like to discuss partnership opportunities with Dettica, in the first instance please use the contact form below or e-mail our managing partner Leyton Price ( lprice@dettica.co.uk ) . See company news for the latest updates. Please get in touch with our managing partner, should you wish to learn more about our services and how we can assist you. 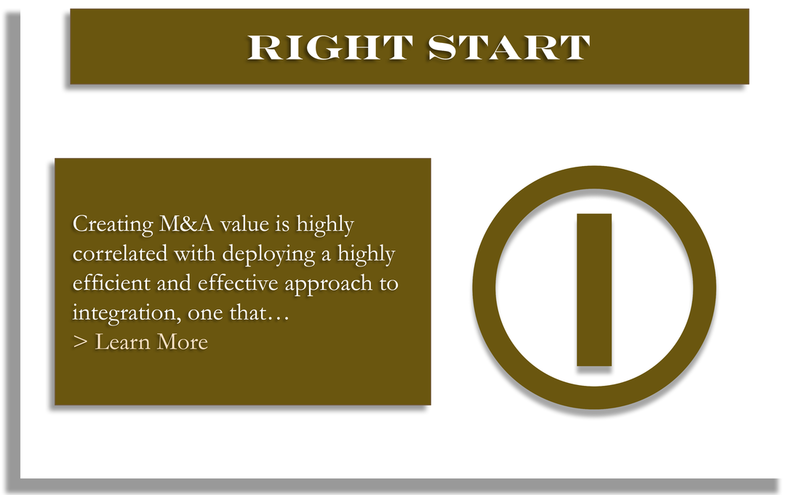 There are many ways we can support you in your next M&A integration or divestiture separation. Whether you require independent delivery assurance, mentoring, training, performance improvement or supplementary expert resource. In the scenario where you have or plan to engage 'big consulting', we are perfectly placed to advocate client interests. With decades of experience working in and alongside these companies, we deeply appreciate their engagement models, frameworks, capabilities, strengths and weaknesses. This allows us to easily identify critical 'air gaps' and vulnerabilities that way too often cause underwhelming outcomes and significantly stress in-house teams. We enable our clients to integrate faster, more easily and create more value. Our services encompass both business and technology and are centred around you. We enable our clients to expedite deal completion, minimise the length of transitional services and ensure a smooth transition. We enable our clients to achieve the highest standards of transaction performance and as independently verified by a leading world class business school. Separation program and project governance, separation cross-functional business impact modelling and execution. 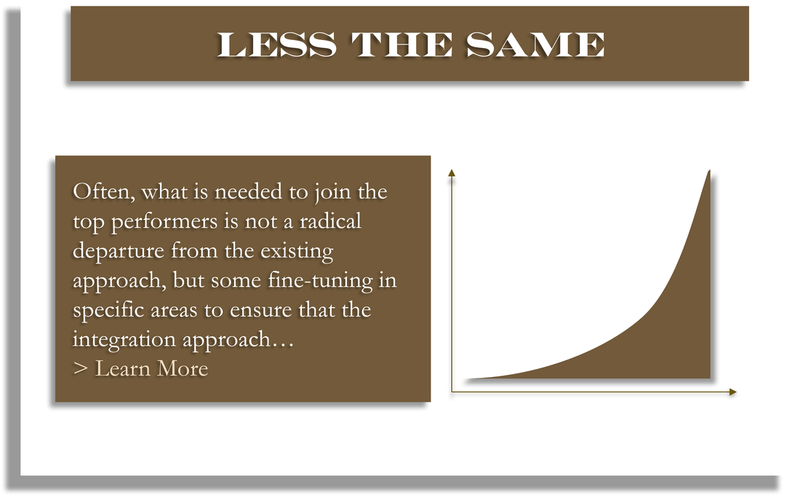 Extensive research has shown that high performance requires both talent and a constant focus on evolution and learning. This 'dynamic mindset' has proven a key differentiator across economies, businesses and technical innovations and is increasing exponentially in significance. 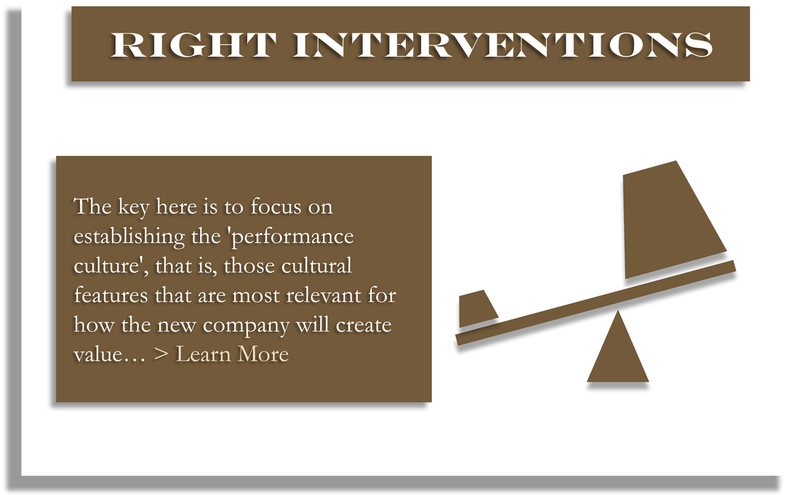 Our approach to performance improvement is culturally aligned, highly pragmatic, accelerated and hugely impactful. It commences with the surfacing of very specific and critical vulnerabilities, deficiencies and problems involving people, process and tools. Often these evade the ‘internal radar’, whilst others may be far more visible but challenging to resolve internally. ​We will then present a roadmap for improvement, including ‘quick wins’, immediate priorities and a robust supporting business case. This is a rapid process, based on fact, extensive experience and proven interventions. We have successfully led, shaped and governed many complex global M&A integrations and divestiture separations, with individual deal values to $3 billion US. 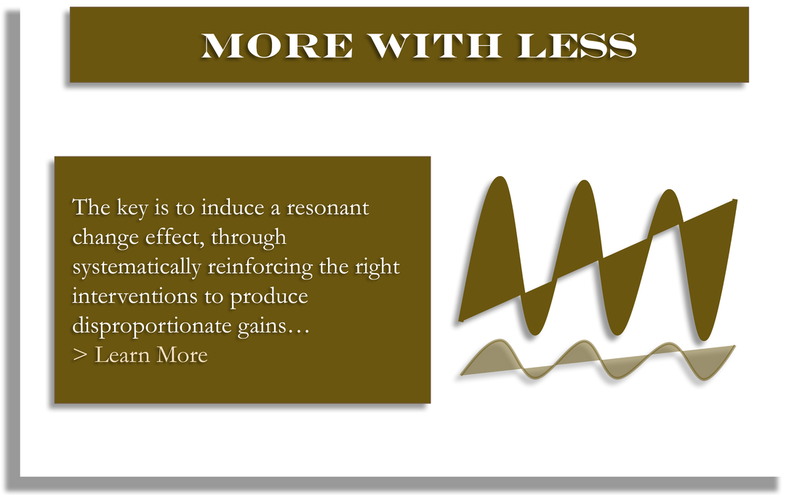 Our approach is centred around our clients and is predicated on achieving more with less. Our consultants are all experts in M&A integration and divestiture separation and have extensive high performance consulting experience. We have enabled our clients to achieve the highest standards of M&A performance and as independently verified by a leading world class business school. ​When you engage our services you leverage a wealth of knowledge and experience in successfully executing M&A integration and divestiture separations. We will rapidly scan your transaction challenges and discuss how we can best support you. Initially this may include, reviewing existing M&A integration or divestiture separation frameworks, scanning in-house capabilities, transaction profiling and assistance in shaping the integration or separation. 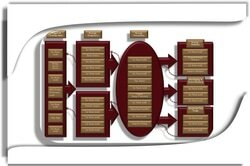 We can also review existing transaction execution blueprints for missed opportunities, as well as risks and 'hot spots'. All businesses must control their costs and M&A transactions are no different. Indeed, there are many different ways to execute an M&A integration or divestiture separation, in terms of both approach and internal-external resourcing profiles. You may wish to engage large consulting partners, leverage independent consultants or rely almost entirely on in-house capabilities. Whatever the proposed resourcing model, we can significantly improve the probability of a positive outcome. For example, we can rapidly profile the transaction characteristics against key criteria to assist you in making the right decisions. This alone, can help you avoid making poor planning decisions and very costly mistakes. We have a evolved a vast toolkit of templates, models and accelerators that are ready to be deployed on your M&A integration or separation. 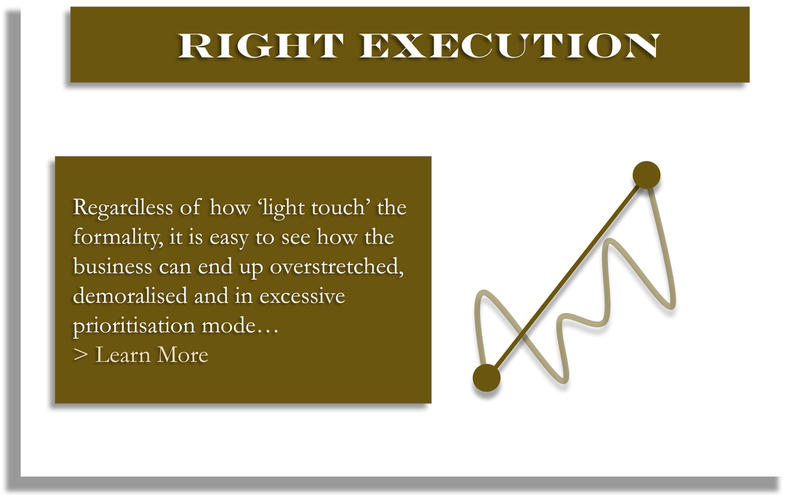 These valuable assets have all been designed to 'move the execution needle at velocity'. These accommodate a sliding-scale from highly agile to highly disciplined processes and where the adoption of which, is typically informed by the outcome of the transaction profiling exercise. This provides us with a range of tools designed to meet specific requirements in terms of rigour and speed of implementation. 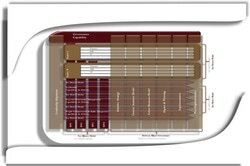 This "plug and play" design provides tremendous flexibility and adaptability within the overarching framework. Below are a few examples of the vast and diverse assets at our disposal and that can be rapidly deployed on your transaction. They have been chosen to illustrate just a few of the many perspectives involved in the M&A integration/separation lifecycle. 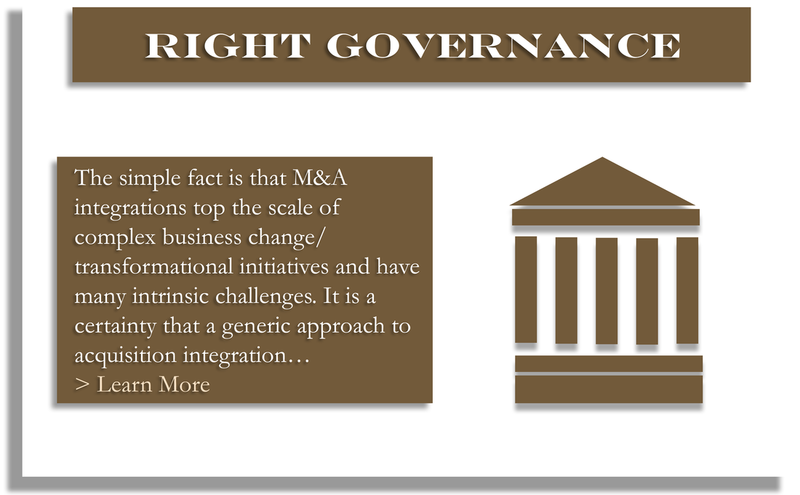 ​The right integration strategy is the one most closely aligned with the deal thesis and corporate strategy. 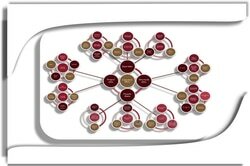 ​Leveraging proven value maps will accelerate and maximise operational performance improvements. 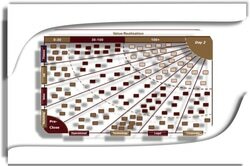 ​Being able to manage all the moving parts and efficiently engage the business requires a proven playbook. 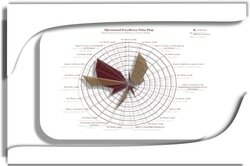 ​Having a clearly articulated value creation roadmap, improves integration focus and performance. 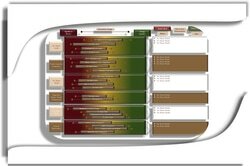 ​ Viewing the integration from multiple perspectives will help identify potential "hot spots" requiring focused interventions. ​Being able to identify and mitigate the integration risks is critical to achieving the right outcome. Dettica has partnered with Midaxo to offer our clients high performance, cloud-based digital M&A capabilities.